Geoparks are regions with many outstandingly beautiful or important geological heritage sites (such as geological layers, rocks, topographical features, volcanos, or faults), selected through a process of scientific observation of the earth (geo). Geoparks include not only the land itself, but also the culture of the people who live there, such as festivals and lifestyles unique to the natural environment. The overarching theme of Aso Geopark is the relationship between human life and the natural environment of Aso Volcano. 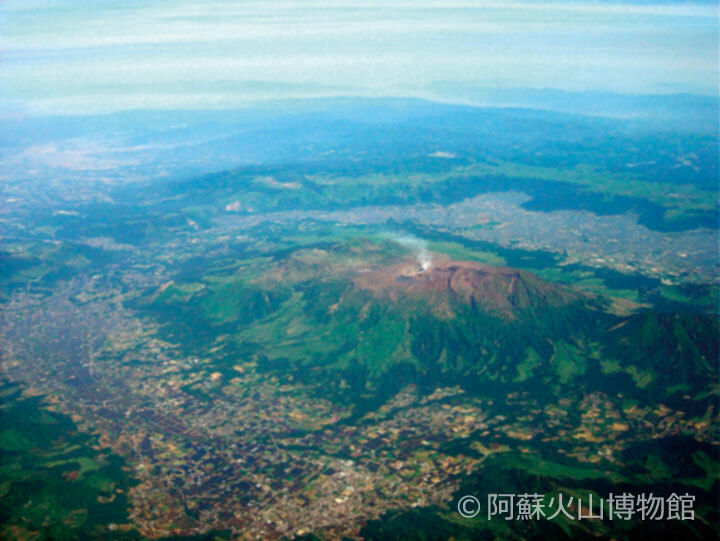 That theme encompasses many stories related to the formation of the land, including the story of the enormous eruption that created the caldera, and of the still-active Mt. Nakadake and the unique landscape surrounding it. Geoparks differ from World Heritage sites in that the primary goal of the latter is conservation, while geoparks place importance on both conservation and utilization. Places that are off-limits to the general public or cannot be accessed because of conservation-related reasons are not classified as geoparks. While protecting natural heritage, geoparks provide sites for studying how the earth was shaped and understanding the relationship between humans and nature. They serve as places for education about science, environment, and disaster prevention. As a provider of geotourism opportunities, a new form of touristic resource, Aso Geopark also contributes to sustainable community development. Approximately 50,000 people currently live inside the huge caldera, under the shadow of its still-active volcano. It is truly a place where visitors can experience the coexistence of humans and the natural world. Aso's natural resources are protected by the National Parks Act and the Cultural Properties Protection Act, as well as by local government regulations. The term "Geopark" cannot be used without first passing a review by a certifying body. Authorized geoparks collaborate in a network to improve quality. Aso received certification as a Japanese Geopark in October 2009 and joined the Japanese Geoparks Network. The park also became a member of the Global Geoparks Network in September 2014. Since activity of Global Geoparks Network became an official program of UNESCO in November 2015, the park has label as Aso UNESCO Global Geopark. As of September 2015, there were 39 certified Japanese Geoparks and 120Global Geoparks in 33 countries. Volcanos are the central theme for many of these geoparks, including Aso. Japan's geoparks are characterized by their location on "moving land" (tectonic zones). Throughout the world, a wide variety of geoparks bring visitors a sense of time stretching over hundreds of millions of years.